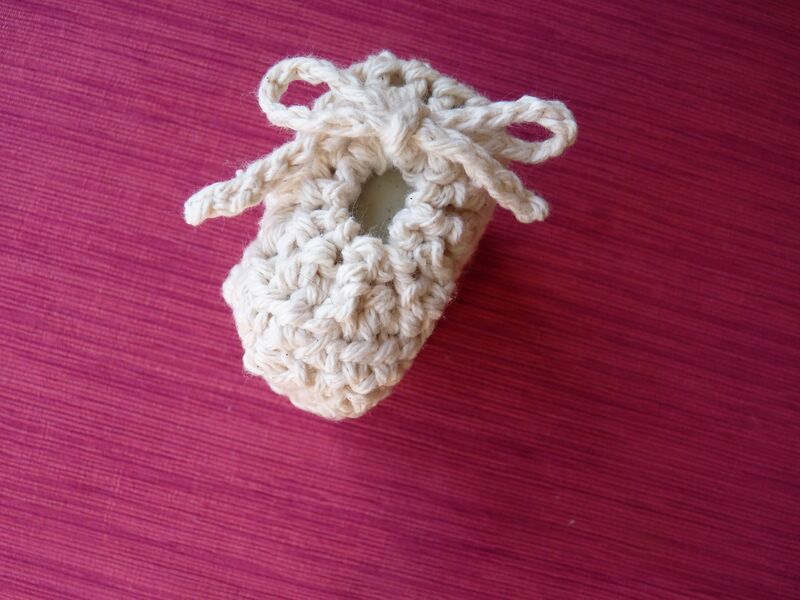 This is a really simple crochet project. 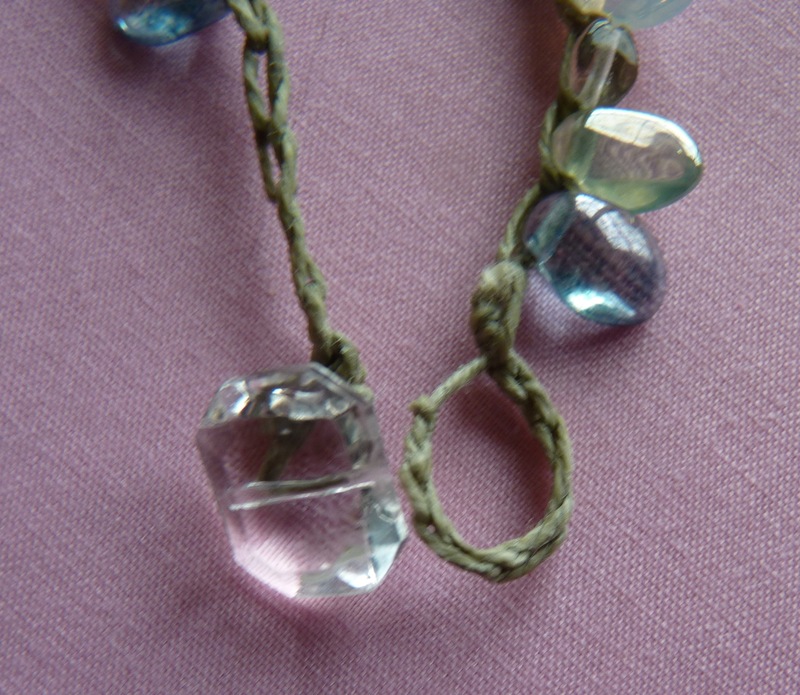 String beads on some thread, do a simple crochet chain, adding beads as you go, and voilá, a pretty necklace! 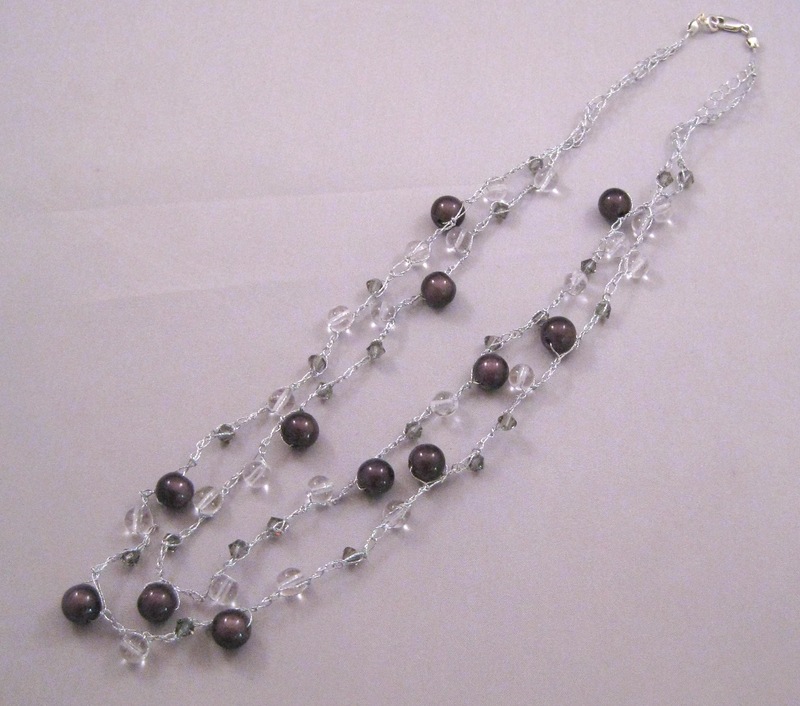 I used a mix of gray Swarovski crystal beads, round clear beads, and larger dark gray beads. The thread is a 2-ply silver metallic thread. This is one of my all-time favorite projects. 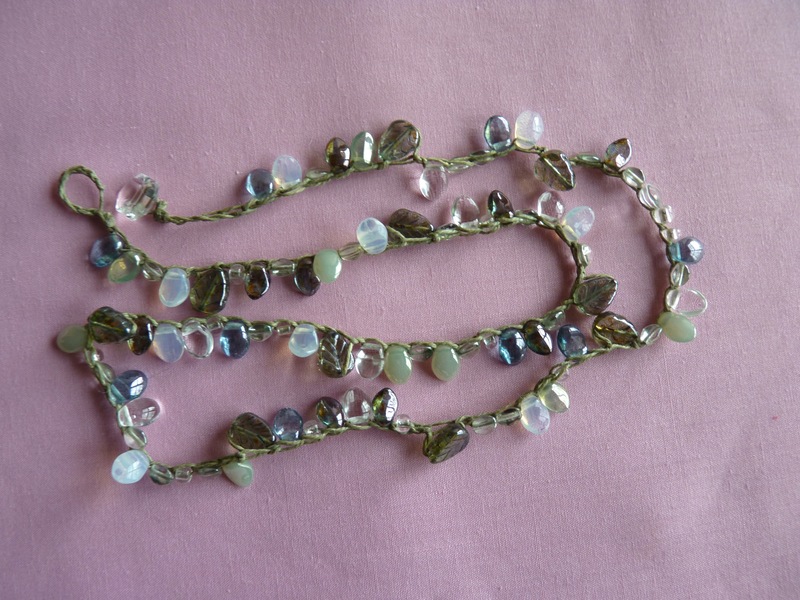 It’s pretty, I wear it often, and no one has identified it as homemade. I should probably include a photo of me wearing it so you can see how nicely it hangs, but I really don’t want a close-up of my neck posted on the internet for eternity. I followed the instructions in this tutorial. She provided instructions for attaching the clasp, but that part was still difficult for me, since I’m not a jewelry maker. Thankfully, the staff at my local bead store is knowledgeable and helpful, and they were able to walk me through it. 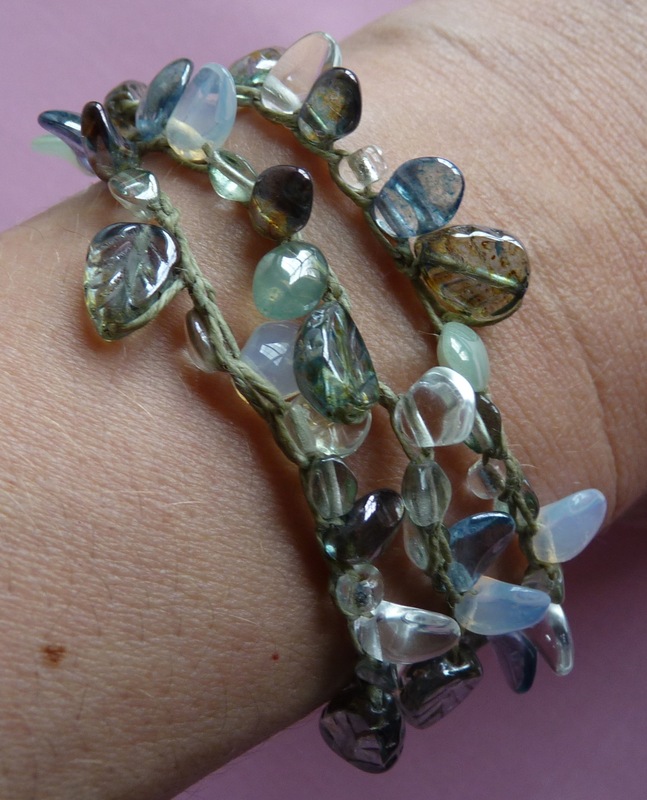 Be sure to string all the beads you will need for the strand before you start crocheting. You may want to add a few more than you think you need to be safe. 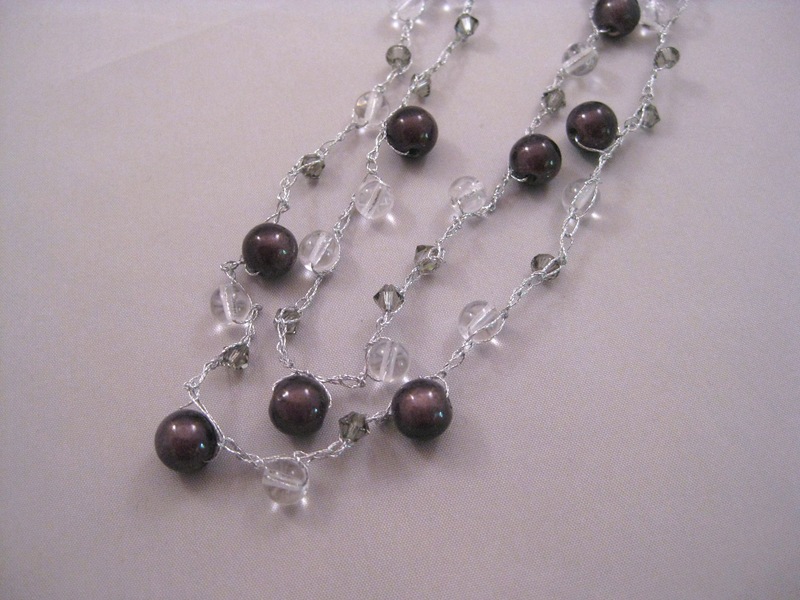 As you can see by the photos, I made a two-strand necklace instead of the three-strand shown in the tutorial. One strand didn’t look like enough, but two was plenty for me. 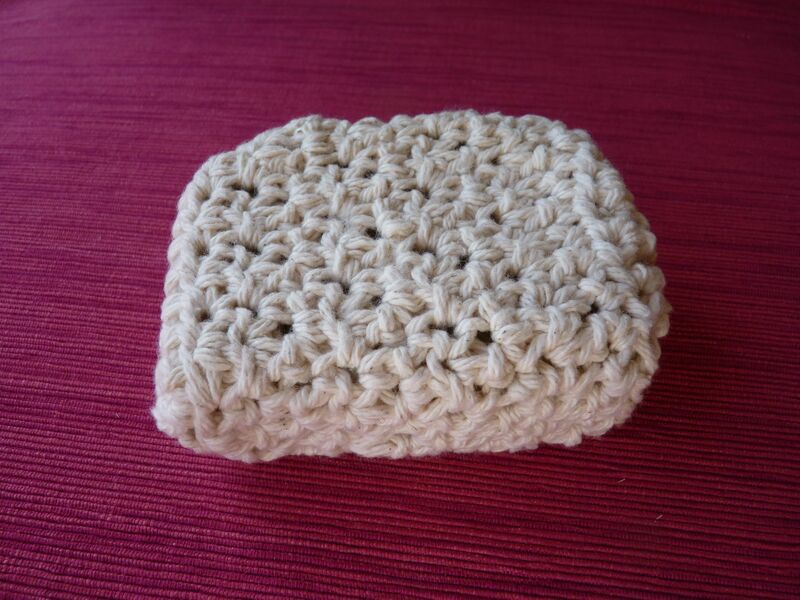 The other weekend, I was at a craft fair with a friend and she was eyeing up some handmade cotton soap savers. I said “don’t buy that, I can make those!” So I did. I looked around online for patterns and decided on the Pampering Massage Soap Saver from Moogly. 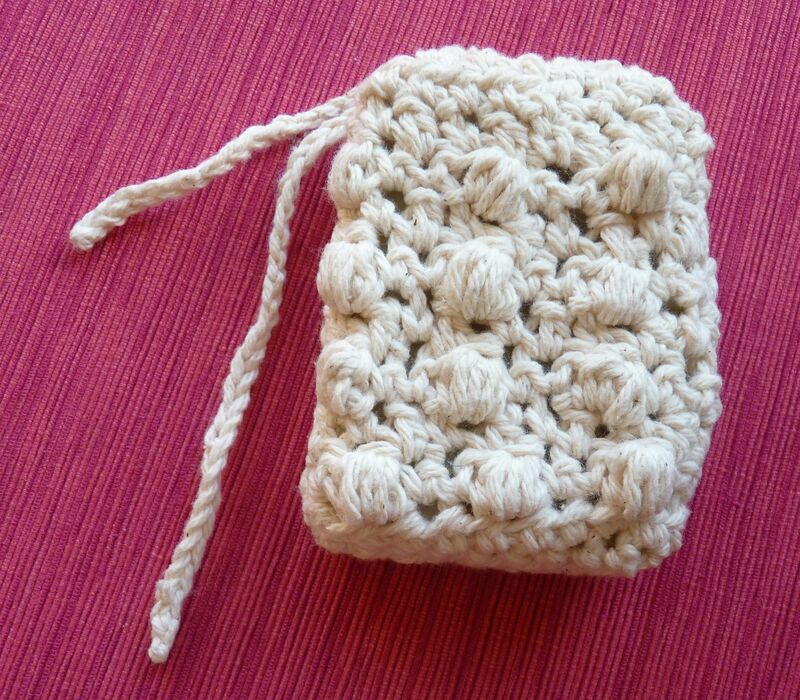 I liked this pattern because the soap saver is shaped like a small bag and has a drawstring at the top. 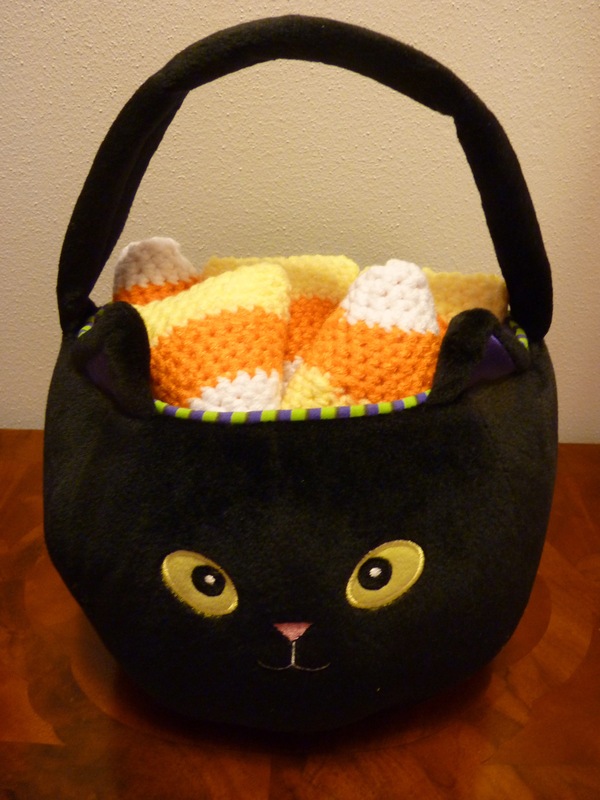 It also has cluster stitches on one side (the massaging bumps), which add a bit of cuteness to the design. The other side is plain. I hadn’t used a soap saver before, so I made one for myself and tested it out with a bar of handmade olive oil soap that I bought that the craft fair. I like it! The soap suds came through and the saver acts like a washcloth. I hope it does actually “save” the soap and make it last a bit longer. 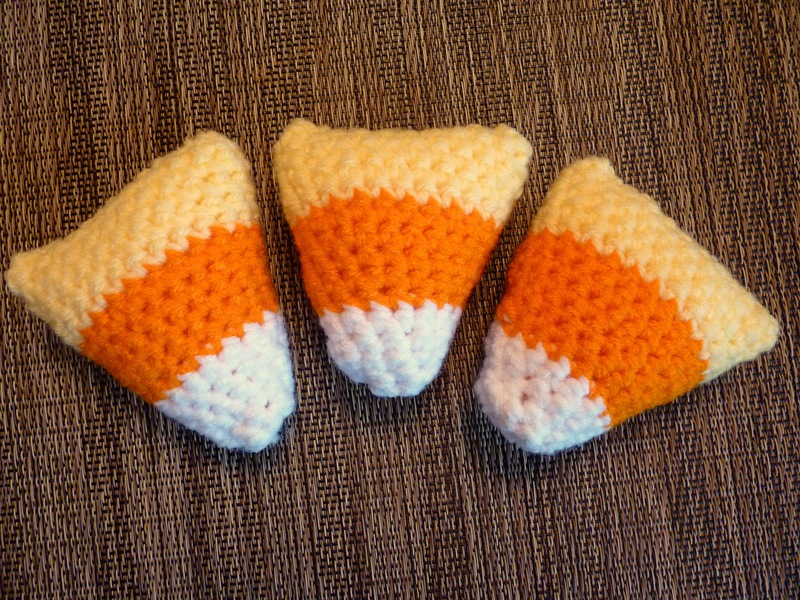 I have plenty of yarn left, so I’ll be whipping up more of these to give as gifts. I used Lily Sugar’n Cream yarn in Ecru. 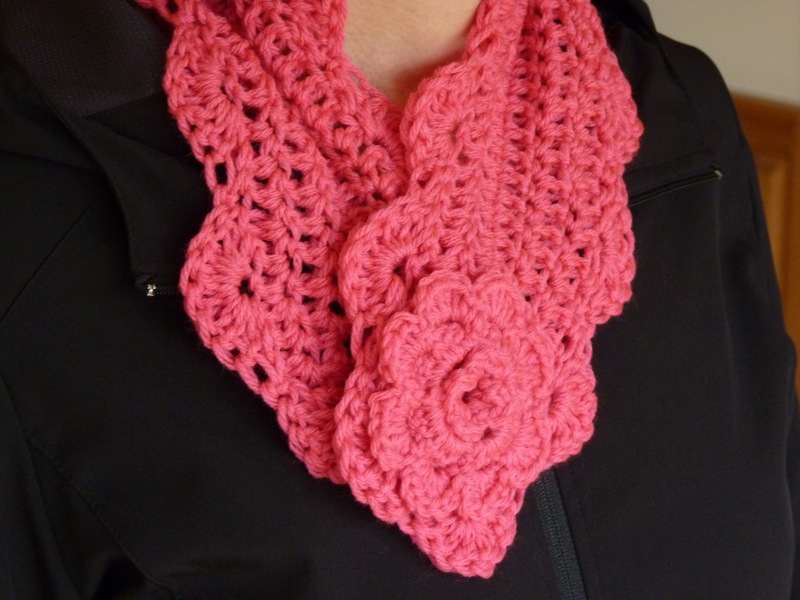 This was my first time working with cotton yarn; it was easy to work with and the finished product feels very nice. Bars of soap vary in size, so if you have a certain bar in mind, have it handy so that you can make sure it will fit. I had to add one more row at the end to make the soap saver large enough to fit my soap. If you want to use the drawstring as a hanging loop, you might want to make it a little longer than 12 inches. Before you start, read through the entire pattern and the comments on the post. Rows 4 & 5 use a technique I have not seen before: row 4 is worked on the right side and row 5 is worked on the wrong side. To work on the wrong side, you turn the piece inside out – so when the pattern says “turn” it means turn it to the right side or wrong side, depending on which row you’re on. This isn’t difficult to do, but it takes some getting used to if you haven’t worked this way before. I have a thing about making craft projects that are useful. And what’s more useful than a pair of shoes? 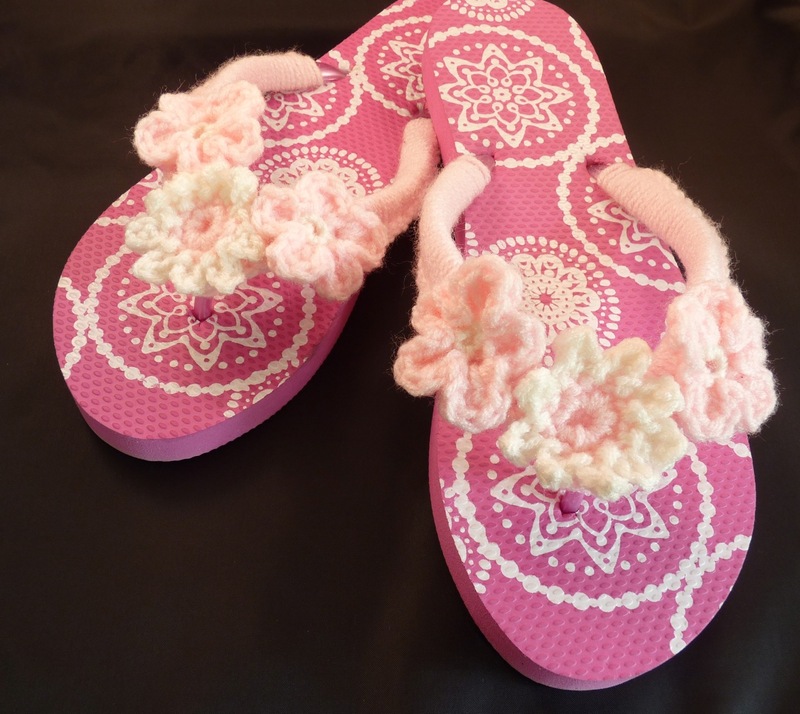 I saw these on the Crochet Today blog and bought some flip flops even before the issue was out. 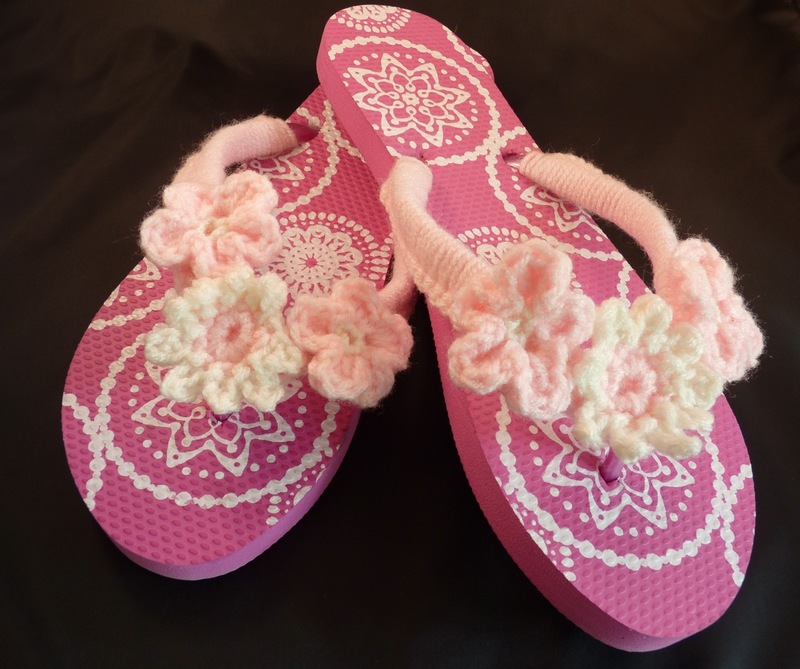 Adding flowers is a fun way to dress up flip flops, and covering the straps with yarn makes them much more comfortable. I don’t wear flip flops that often, but that might change! I started with the pattern in the July/August 2011 issue of Crochet Today magazine, previewed here. The daisy (white flower with pink center) is their pattern. I just wasn’t understanding how to crochet around the straps, but then I found this great tutorial that includes photos. It’s really easy to do! The tutorial also shows another idea for embellishing flip flops if you’re more of a button person than a flower person. I used these instructions to make the other flowers (pink with white center). Sew the flowers onto the covered straps and admire your handiwork! There are lots of crochet flower tutorials online, so with a little searching, you can find just the one you’re looking for. 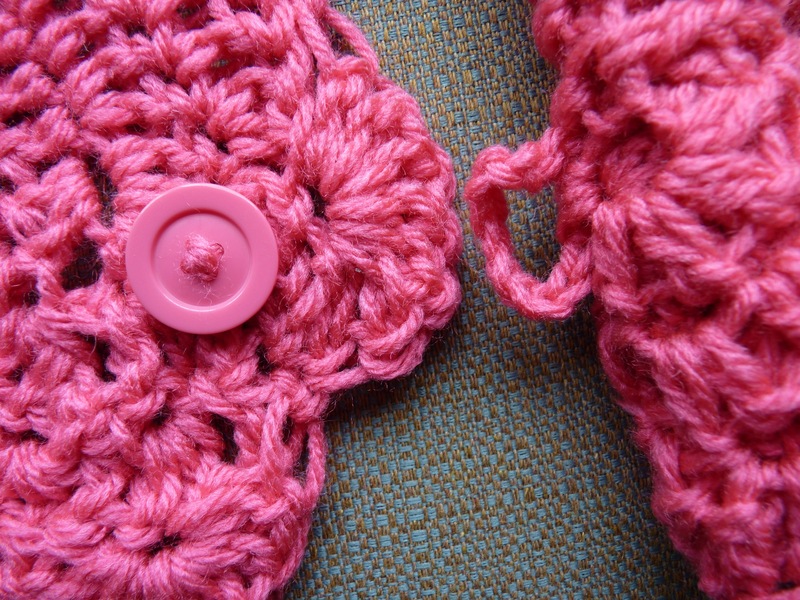 Here’s one that shows how to decorate crocheted flowers with buttons and beads. I haven’t tried that yet, but I might for my next pair!